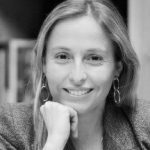 Teresa Sádaba is the Dean at ISEM Fashion Business School, a leading center in the research and education in Fashion Business, where she also teaches Strategic Communication for Fashion Companies. Professor at the University of Navarra and at George Washington University. Visiting professor at the Université Paris XII and Complutense among others. Fulbright fellow. PhD in Communication, BA in Journalism and Political Science. Expert on framing issues and strategic communication. Author of “Framing: Una teoría para los medios de comunicación” (2006), “Framing: El encuadre de las noticias” (2008) or “Moda y Marca España” (2012).